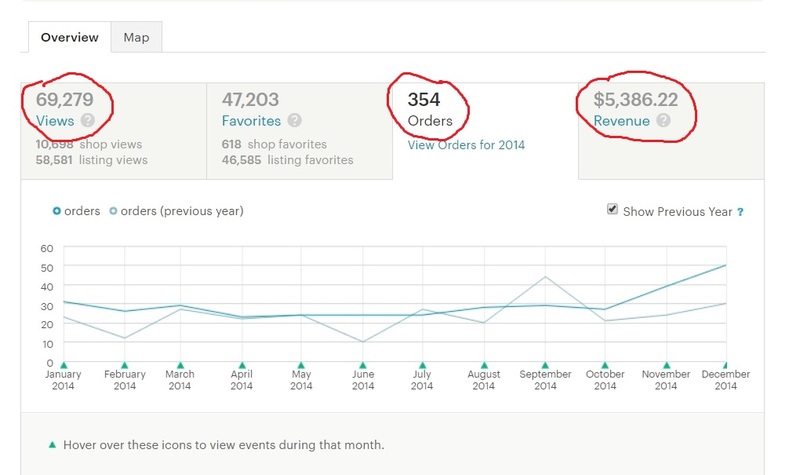 We have been considering Etsy's powerful stats. How can we use them to improve our shops? That’s our views-to-sales ratio. For that, we need to pull up a longer period of time, like 6 months or a year. Calculate the number and then compare it with another similar amount of time. Look for trends in that data. As an example, here are figures from my shop. 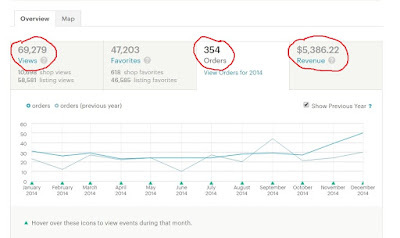 During a recent 12-month period, I had 73,730 views and 450 orders. That’s 163 views per order. Last calendar year, my ratio was 145 views per order. The $64,000 question is, why? In my case, I have an idea. I had increased my views by my team activities, which was skewing my statistics in that direction. I’m OK with that. Put another way, if you play a lot of games which raise your hearts/clicks and favorites, but the items don't sell, your ratio of clicks to sales is different than if you don't. They are saying that Etsy's search algorithm favorsitems that sell with minimal clicks. I have been working at selling fewer high-dollar items. That is less work than selling more low-dollar items. Am I making progress? To determine this number, I divided my total revenue for a period of time by the number of orders for that same period. In my case, the last 12 months was $18.46 per order, compared with $16.31 per order last calendar year. That’s an improvement. The numbers are moving in the right direction for my own shop goal.